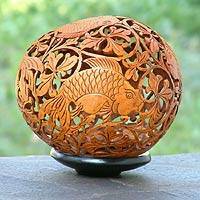 A coconut shell is transformed into an amazing sculpture featuring octopus in an underwater garden. 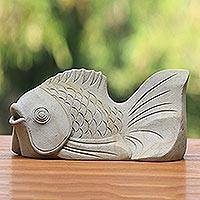 From Eka in Bali, the sculpture is carved by hand with lavish detail. Includes an albesia wood stand. "I was inspired by the urban belief that having a seahorse at home brings luck and prosperity," says Peruvian artist Miguel Mej?a. 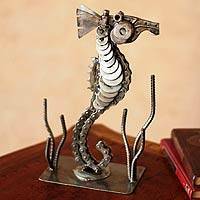 He masterfully transforms rugged pieces of metal, auto and bike parts, into the delicate presence of this marine creature. " 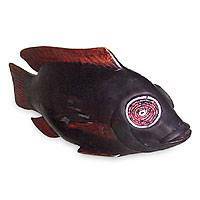 Mysterious, this mudfish travels far from African coasts, bearing with it the artistry of designer Nana Adu Amankwapam I. 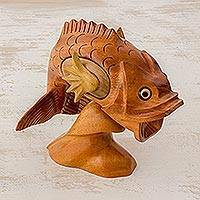 The statuette is carved from sese wood and stained with polish. 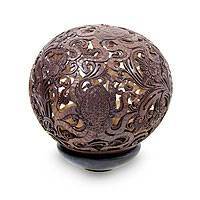 It features vivid eyes patiently crafted of beads.